Saga #34 was originally released on 2/24/2016. By Zack Quaintance — The closer we get to the end of this re-read, the more I remember actually reading these past issues. With this one, for example, I can remember the very day and conversation at the cash register I had while purchasing this comic. I know it’s not that interesting...but also I’ve mentioned it twice later in this piece! Anyway, the point is we’re almost to a place in this re-read where you might say we’re winding down, well past halfway with the end in mind, if not entirely in sight yet. This entire deal has been a success, at least for me personally as someone striving to better understand this story and why I enjoy it so much. I just keep coming back to honest depiction of family dynamics within such a well-executed burst of bright graphic sequential storytelling. That’s it, that’s the simple secret to its success. 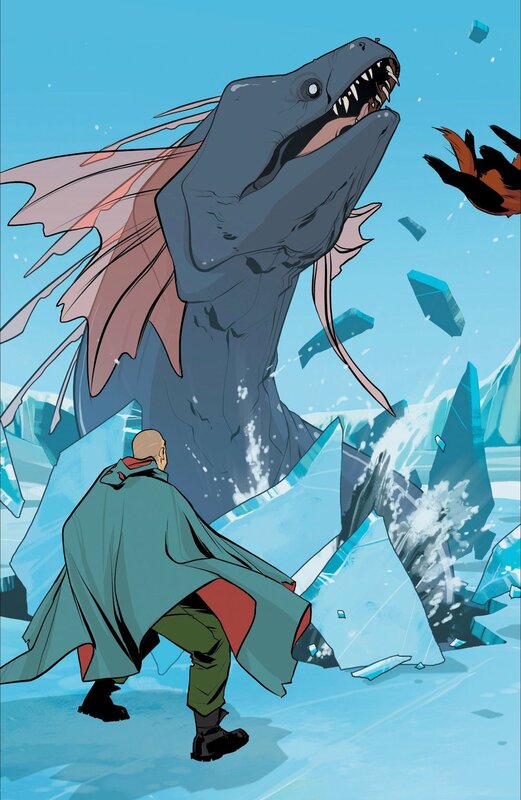 Let’s check out the rest of Saga #34! So, I suppose they’re saying old friends are gold? I suppose that also implies that there’s going to be a reunion here, but there isn’t one, really. Oh wait, at least there isn’t the type of reunion you want. The characters that do get back together (we’ll get into the specifics later) are not exactly happy to see each other. The Cover: So, I already touched on this a little bit above, but this cover was soooo good that the clerk at my old LCS back in Austin, Texas (which I left in 2016) said she bought it to have it in her house despite not being a fan of the book. And I don’t blame here. This one—while not one of the more conceptually striking Saga covers—is just aesthetically gorgeous, and it also features Saga’s most adorable character. That’s a winning recipe. The First Page: A nice opener, to be sure, one that also seems to be a definitive statement that Petrichor will be staying around as a main part of the cast (always a question on Saga), or at least as main as characters like Upsher and Doff. The alien stuff is a little cliche, but it’s no big deal, and was then/continues to be timely when viewed through the lens of modern political discourse...sadly. Visually, I also just really like all the purple on this first page. The Summary: Petrichor and Hazel muddle through some slight communications issues to tend to Hazel’s teacher, making it look like she got knocked out because a tiny chair broke (smooth). Meanwhile, Marko and Alana find Friendo and Ghus, but they’re now with Prince Robot IV...who puts a bow and arrow on them. Prince Robot IV does not want to help with their planned prison break, but they persuade him to by essentially insinuating they’ll tell his dad where he and his son are hiding out. Back with Hazel (this issue jumps around a lot), Hazel and Izbel visit Hazel’s teacher in the infirmary. Hazel tells her the truth about her parentage and gives her a copy of the forbidden text that inspired her existence. The teacher is very kind and very understanding, and hilariously a bit condescending about the merits of the book as a guide for life. Meanwhile (again!) The Will still has Upsher and Doff captive, debating with a vision of his dead girlfriend about whether he should kill Doff, Doff who eventually dangles a way for The Will to find Prince Robot IV, whom he’s sworn to kill. 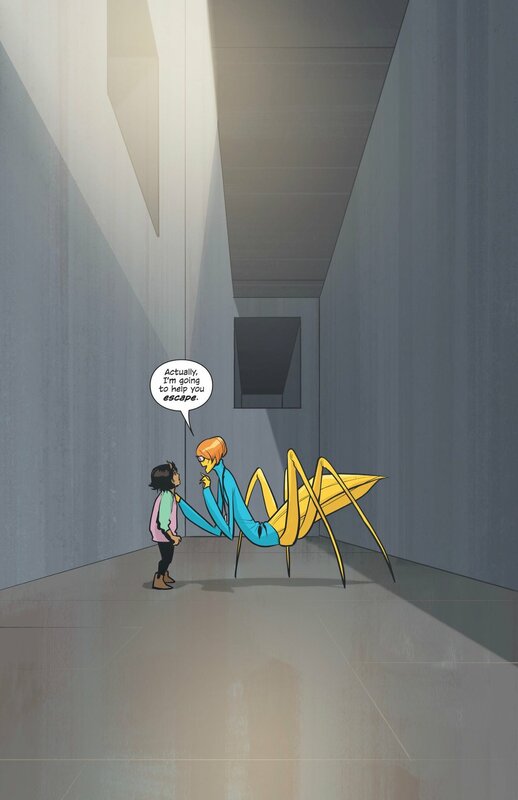 The issue ends with Hazel’s teacher telling her she can help her escape. The Subtext: There really doesn’t seem to be much of any great meaning. I suppose there is something her about perspective, going all the way back to the first page in which Hazel’s narration suggests the very concept of something being alien is all a matter of perspective. There’s also a bit of an implication that being educated can help one come to a greater understanding of the world and peace, etc. Mostly though, this is a plot-heavy issue that moves around our characters, in an organic and compelling way of course. The Art: I’m actually going to start doing something different with The Art section. Instead of picking a different motif each week and using it to praise Fiona Staples artwork, I’ll just operate with the understanding that it’s all fantastic (because it is), and instead highlight my four favorite images, as I do for my nightly reading projects on my Twitter. Enjoy! The Foreshadowing: There’s not so much foreshadowing as there is a nice reveal that (as we suspected) Hazel’s teacher is a sweet and understanding lady who will at least try to help her, even if I remain unconvinced/unable to remember whether she’s actually able to. We shall see! Join us next week as we get into a stretch of issues where the book really REALLY hit its stride!